Jason Bourne’s new, quieter life with girlfriend Marie in India is rudely interrupted when a Russian assassin chases the couple through the busy streets of Delhi and shoots Marie dead with his sniper rifle. Bourne’s quest for revenge takes him to Berlin where he discovers that he has been framed for the death of two CIA agents and pinned as the culprit behind a $3m stash of stolen funds. In reality, the cash has been embezzled through the grubby hands of an unscrupulous Russian oil tycoon and some corrupt US officials. 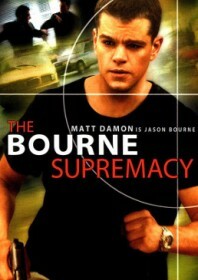 As Bourne struggles with his destructive amnesia, he begins to question his own innocence as he dodges the assassin’s bullets in an attempt to clear his own name. This is just as rabid as the first film, hot-footing through nearly every continent emcompassing India, New York, Moscow and Berlin, adding a jetsetting quality to possibly the most exciting action movie franchise of recent times. The stunts and car chases are routinely edgy and innovative with director Greengrass employing just about every trick to great effect. Bourne continues to remain one step ahead of his pursuers through the sort of hi-tech gimmickry and quick-thinking that would put Houdini to shame, disappearing under subway stations, tapping phone lines, double bluffing just about every authority figure and turning up in random buildings with little or no explanation. To even query such things is futile. He’s Jason Bourne, the guy can do anything. As for Matt Damon, it appears he has quickly carved out the most definable role of his career.